I feel that not being able to travel for more than two months is starting take a toll on the state of my mental and emotional health and I have to do something QUICK. Well, since I can't really just book myself a ticket and hop on the next plane anytime soon, I will then seek happiness by visiting a new restaurant and enjoying the company of really wonderful friends. It was a rainy Saturday afternoon when I met up with two of my former colleagues. It's funny that we only started hanging out after one of us has left the company. It was our common love for food that has brought us together. Every time we meet up, we make it a point to try something new. That day, it was at Ortigas Home Depot where we found two yummy food spots that's worth going back for again and again. First stop was at Buffalo Wings 'n' Things, entering the tiny restaurant, I saw various photos of American baseball games. The clean white walls and the long rectangular black board gave me that casual American sports-cafe feel. We read through the menu on the wall and we immediately agreed to get the Triple Sampler Buffalo Wings (Php. 365). This is the perfect way to be able to try three flavors in one go. In this visit, we got the New York's Finest, Dial 911 and the non-spicy Garlic Parmesan. My taste buds are not that brave when it comes to spicy food so I'm actually glad that my friend included a non-spicy version just in case it gets too hot. I took one bite of the Garlic Parmesan and I love the sweet buttery taste of the coating over the crispy buffalo wings. It's delicious even without any dip and I'm sure this flavor will be a hit with the kids! Moving up, I try the New York's Finest but as a precautionary measure, I ordered some bleu cheese (Php. 35) in case I needed something to soothe the spicy sting. I took one bite without the cheese and I was surprised that although it has some spicy hint, it was pretty bearable. I continued slicing into my buffalo wings, completely forgetting to add in the cheese. My friend, the brave foodie soul, tried the Dial 911 and this one was hot as she had to dip her wings into the bleu cheese. Still, she enjoyed the spiciness of her buffalo wings that she continued to dig in for more. I sat out on this one and just watched my two friends enjoy this smokin' hot flavor. After enjoying our meaty and spicy buffalo wings, we hopped over next door for some Mexican fiesta at Jalapeño! Mexican cuisine always spells F-U-N!!! With its colorful choice of ingredients and a burst of flavor in every bite, it's one reason why I never get tired of going Mexican! 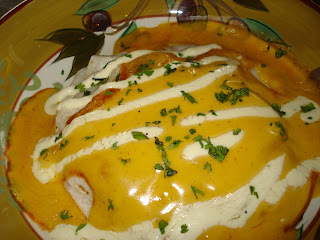 Following the name of the restaurant, we ordered a Jalapeño and Cheese Enchilada (Php. 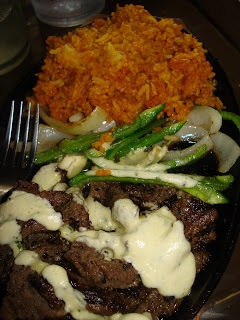 175) that has that tiny "hot and spicy" icon displayed right beside it and an order of the Pepper Steak Fajitas (Php. 225) which was said to be one of their best-sellers. First came the Jalapeño and Cheese Enchilada, my mouth watered at the sight of the oozing melted cheese on top of the enchilada. We sliced this into eight and each took a slice. One bite and my mouth burst into flames. As my friend puts it, it's fiery hot with Jalapeño bits scattered all over. We had to request the server to immediately fill our glasses with ice cold water. Still, the enchilada was really delicious that we still continued to take one bite after the other. We kept on saying how spicy it was but was surprised to see the platter half empty after a couple of minutes. What a spicy start *whew*! While waiting for our second order, I was praying that they would go easy on the black peppers. The last thing I needed was another spicy dish. Finally, the meaty aroma filled the air as our server presented our hot skillet containing tenderloin steak cubes, crunchy green bell pepper and mexican rice. He also gave us a plastic container of three tortillas wraps. This one, I liked the most! I enjoyed filling up my tortilla wrap with the steak cubes, mexican rice, veggies, sour cream and my favorite -- guacamole! This is one dish you'll have to use your fingers to assemble and later on to enjoy. There are still a lot of dishes that I'd love to try at Jalapeño such as the Baked Jalapeño Cheese Dip, the Steak and Cheese Quesadillas or the Grilled Chicken Mexicana. I'm definitely listing them down for my next visit. ohh im so jealous, ive been meaning to go to jalapeno but still havent had the opportunity to taste their dishes! Hello, I've been following you on my Google Reader for a few months now. I've been wanting to try Jalapeño since I've seen it in various food blogs, I hope I get to try it soonest. Will link you up, ha? @mrs lavendula: you have to try it! 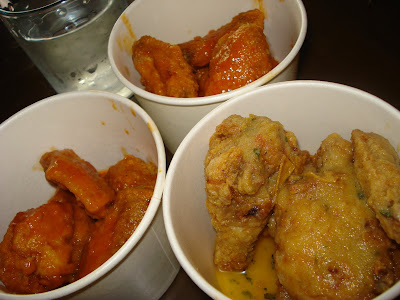 basta try both jalapeno and buffalo wings and things!! @Dea: aww thanks so much for visiting my site :) sure please do link me up!